Small mod to add fast travel to Morrowind in the form of Sign Posts. Thanks go to Andromeda, for the idea, Jac for the initial script help, and Chainy for helping with more advanced scripts. The idea is something my girlfriend Shelley (aka Andromeda) had. 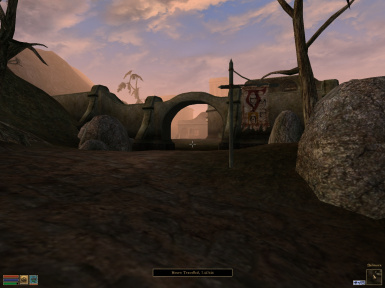 The idea was to add some form of simple fast travel into Morrowind. 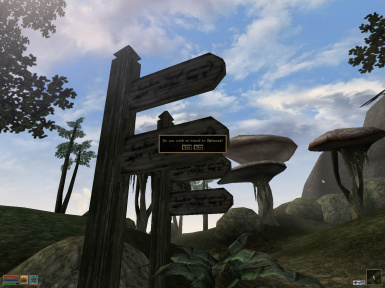 The mod is intended as an immersive form of fast travel, allowing the player to travel to whatever location is shown on a signpost. If you see a road sign you can click on it, be prompted with a menu confirming if you wish to travel to that location. Time advanced based on the distance of the player to the destination. Added functionality for calculating the distance between the player and the destination coordinates, and adding travel time based on that. Added a message displaying the number of hours taken to travel to the sign post destination. Cleaned up scripts in general. After a long long time i noticed that this mod was completely broken.... Due to the Gnisis and Ald Velothi coordinate scripts having the wrong coordinates... Thank you to the people on Nexus who noticed this. I am currently in the process of implementing distance based calculation like I said I would all those years ago. Added Real Signposts compatibility. Requires you to install real signposts first obviously. Only use one plugin, DON'T have this plugin and real signposts active. I chose Real Signposts for a compatible version because it is the most used on the NEXUS.